blimen' Mr Gloom's nose has been pressed up against my window for what seems forever and a day now. on Saturday, i thought to myself that's a little odd Tif, that there shadow in front of your studio window... then the reason for the feeling of gloom became clear. well it freaked me out a little cause Mr Lurgy was already inside visiting with Our #3 and i have to say i fear Mr Gloom way more than Mr Lurgy. indeed i would put him even above Mr Procrastinator. for although Mr Procrastinator is a cad in more ways than one, whilst he visits it does not mean one is not doing things. sure one is pondering, pottling, pacing and achieving very little whilst doing so, but at least the little cogs are turning to some degree. but with Mr Gloom i cannot find a positive, he darkens where ever he roams and appears to take great joy in doing so. on sunday i gave myself a talking to, i told myself i am armed with ammunition and i can and i will fight him. first off we have word of the week 'high hopes', quite obviously not a hint of gloominess about that. i said 'high hopes' quite loudly several times on sunday and i noted every time, his shadow recoiled a little. then there is my forsaken little souls, collected over the past few years, some i found, and others found me through the kindness of folks. i gathered them all up from their various resting spots and popped them all together on one shelf in our bedroom. even the angry looking russian doll seemed to relax her brow a little upon noting Mr Gloom was sweating and loosening his collar. next i got to thinking about how my musings had gone to mush and my pennings had gone to pants, (please skip over that bit Janine, if you happen to read this ramble) i turned my attention away from the book so i may start afresh in a day or so, therefore giving me a grand opportunity to stock the shelves of my little shop. hurrah! hooray! i thought, for before, during and after christmas i spent any spare moment wisely crafting wares to sell. for some time now a lovely pile of handcrafted goodness has waited patiently in the corner of my studio, for their moment to shine. however day after day and week after week Mr Gloom has not played fair, thus not only my pennings are pants but also my photos. yesterday continuing on from sunday, i refused to be weighed down by gloominess and set about with Carlos my trusty camera to see if we could rise above the darkness that envelopes the shed. i am delighted to report we have done a fair job between us. i would not shout it from the roof tops, nor enter the photos in any competition that maybe passing. however considering the circumstances with which they were taken, i think Carlos did a pretty peachy job. pah pah pah Mr. Gloom, you are pants, get yourself away from Mossy Shed you disgraceful being. I remember lots of days in times past when Mr. Gloom did descend into my life, don't you let him stay, he takes too much. I'm sending lots of High Hopes over the sea to get him running for the hills (sorry Mr. & Mrs. Hills). Gazing adoringly at your lost souls and peachy creations will soon get Mrs. Bright and Breezy picking up her broom and flying lickety spit back into the shed. I think so many people are suffering from the presence on Mr Gloom at the moment. Glad you have been able to shift him somewhat...I think I may have made a start today as well. The horses on your bookshelf are the exact ones my mom used to have - by any chance do you remember where you bought them?? Any help is appreciated! 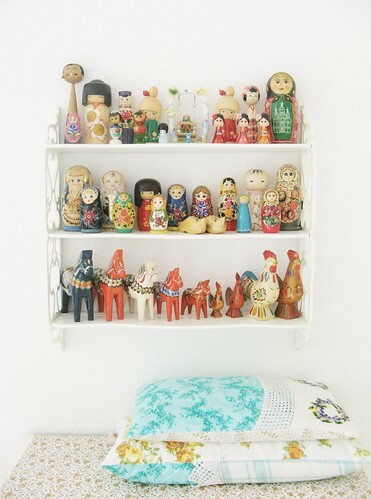 wow, love your dolls and figures, they look so nice in a display together, so pretty! Go away, Mr. Gloom! You have no place in the Land of High Hopes! Skedaddle to other climes! Too many people are relying upon the very talented Tiff and her sunny ways! Good thoughts for you shall dispel The Gloom....! It is delightful reading your blog. I hope you are feeling much better - winter and myself do not usually do well together. We are moving to a new home on friday that has huge windows allowing lots of natural light in and overlooking a lovely Australian forest. I am hoping this winter coming up will not all Mr Gloom in at all! Tif, love your hearts and it looks like Spring might come early to our beloved NW US! i do so enjoy how you find the courage and the umph to show mr. gloom the door...i shall emulate as best i can. thank you, tif, for reminding me that i have charge of my own "mossy shed"...cheers. Dear Dottie...Mr Gloom is one of those winter visitors that just hangs around windows and doors skulking til you let him inside. But...don't let him inside your lovely house...keep telling him to get lost in very solemn tones and giggle! Giggling will send him running as fast as he can go! He is positively allergic to giggling and won't come by your place again for some time. If filling your shop window is good giggling fodder then that is highly recommended. Children also help in causing a fit of the giggles...by the way. ooo you have such pretty wares in the shop window! It seems that the shop has been a bit quiet since I stumbled upon your blog. I'm excited to see what comes next! Mr. Gloom does seem to accompany this season, which is all gray and damp in an icky-gets-in-your-soul sort of way down here in the bluegrass state. 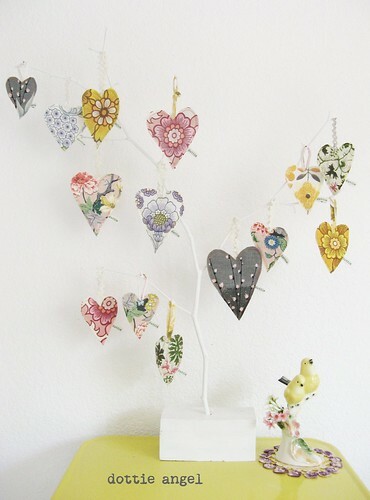 I do wish I could have a bit of the light and bright your tiny heart tags are hanging out in! I completely adore your writing! I will be thinking very nasty thoughts toward Mr Gloom. I am wishing you warm and sunny days! I am running from Mr Gloom in my vintage 63 Airstream. Wanna come with? I like the dollie on the top shelf all thecway to the laft with the long neck. You must make her an itty bitty necklace and i LOVE the tree of HEARTS! Can't wait to see what else you have been creating! Remember to add "whilst" and pajamas with a "y" to your list. Oh dear I do hope you beat off mr gloom. The heart tags are lovely indeed! Am so glad I'm not the only one Mr. Gloom has been visiting - he's still here, peering through the skylight at me but will follow your example and do something cheery. Oh yes, Mr Gloom gets around, doesn't he? The little tart. It's his favourite time of year, but we'll show him! I am thrice clicking my heels together and repeating "High Hopes" out loud. Jabbing him with a crochet hook helps, too.